Your mother dies suddenly, unexpectedly, four thousand miles away. You manage to change your flight home for the next day, but then you can’t make it to the airport because there is an unexpected storm, the worst since records began three-hundred years ago. Trees are down, blocking the roads. Eighteen people have lost their lives and many more than that are injured. You’re in shock at your mother’s death, so it’s hard to register the storm. Meanwhile, you’re stuck in another country, so you sit in the garden with your watercolors. The storm passed hours ago and the sky is blue. The air is clear and sharp. You’re oblivious to the cold as you start to paint. Though your brush moves quickly from water to colors to paper, you don’t know what you’re painting. You’re just doing what you do. A picture begins to form. The colors are blues and purples that fade into pink. There is darkness and light. A sense of flow from upper left to lower right. 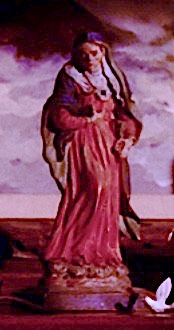 In the center is a woman walking. Her feet are bare. 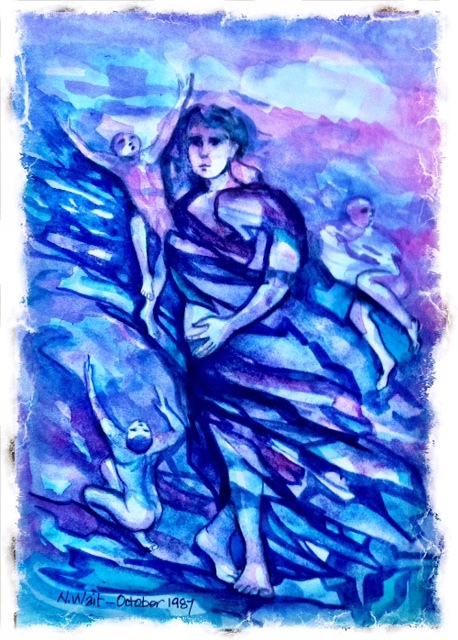 It is hard to say what she is wearing because her blue and purple garments blown by the wind seem part of the stream flowing from upper left to lower right. She walks forward, as if to the right, yet her body turns to the left. She gazes to the left. Her left arm reaches across her body. Her hand appears to be touching something, holding onto some sort of object as if to protect it. Could it be the stump of her right hand, cut off at the wrist? Her eyes are dark, in shadow. She looks sad, unhappy, stunned, bewildered, lost. 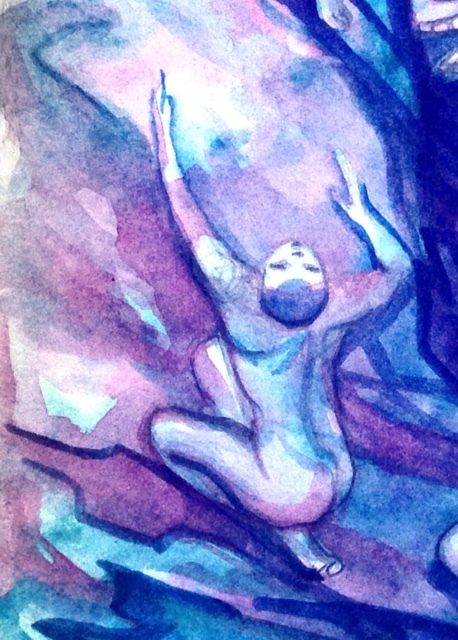 Three small figures surround her, two on her right, one on her left. The two on her right raise their arms as if pleading with the heavens. Are they trying to call her back? Are they perhaps a symbol of you and your sisters and brothers wanting to bring her back? You’re all grown up now, not children anymore, but you’ll always be her children. She that was, and is no more. The feeling overall is a determined looking woman walking into a storm or through a storm. She doesn’t appear lost after all. She is a traveler with a purpose. A woman with a mission. You finish the picture and let it dry. but you don’t really understand it. *** I painted this picture 28 years ago today, and posting it on the 28th anniversary of the Great Storm over Southern England in 1987. This year, 2015, is one of those years when the days and dates exactly match up to the week in October 28 years ago when my mother died of a stroke. She was in Illinois; I was visiting friends in Buckinghamshire, when because of the havoc wrecked by the storm, it was days before I could fly home. I’m sharing it because this past Monday, Columbus Day, the day that corresponds to the Monday when my mother had a stroke, I happened to watch the 1998 movie, A Price Above Rubies, with Renee Zellweger as Sonia, a wife and mother married to a religious Jew in Boro Park. I’d seen the movie when it first came out and forgotten most of it. I didn’t remember at all the scene when she wakes up in bed after spending the night in with Ramon, a devout Catholic, and stares at the statue of the Virgin Mary on the mantlepiece as we hear the roar of a passing subway train on the elevated tracks near the window. Or was it Mary Magdalene? I found myself staring at the statue too, and replaying that brief part of the movie over and over. If it was Mother Mary, then I don’t remember ever seeing her quite in such a pose before. 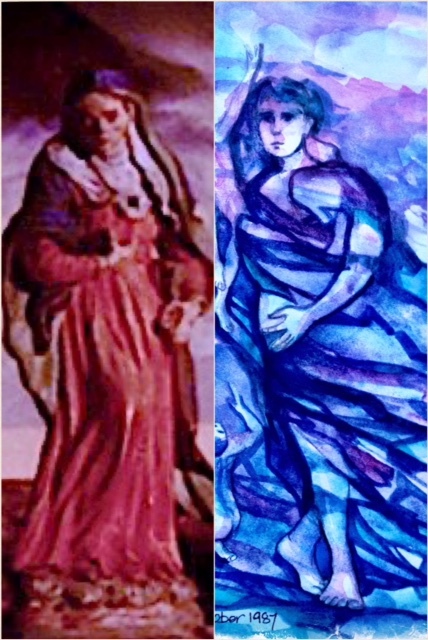 And yet she looked unbelievably like the woman in the watercolor I had done after my mother’s death. The look of despair on her face, the darkness surrounding her, the direction she was facing, and the way she was holding something in her hand. 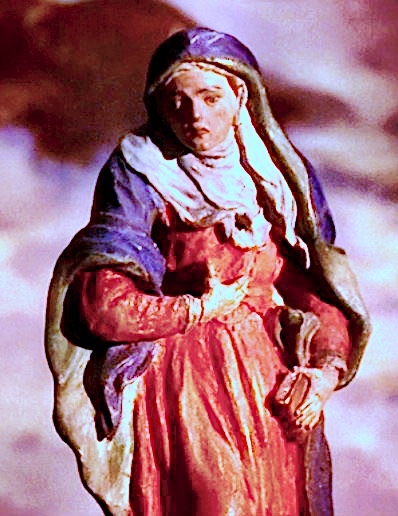 This Mary was grieving. And I knew why Sonia was so moved by the statue, because what she saw was a symbol of the Divine Feminine. And it seemed to give her new strength and resolve. While I was watching the movie, I realized it was Columbus Day, the anniversary of my mother’s stroke, and when it was over I went in search of the watercolor I had done all those years ago, and for the first time I saw what I had done. I had created a sort of undefined Divine Mother. A sad mother, lamenting the death of her children. But also an angry Mother Nature wrecking havoc on the landscape. And what of the stump she held with her left hand? It could have been one of two things. When I was small I used to play a game called “Mother.” I held up a pinky finger of one hand and bent it as I called, “Mother, mother…?” And up came the pinky of the other hand, bending too as it answered, “Here I am!” I was small enough then to think my mother and I were still one. And now that other hand was gone, only a stump remaining. Or, the white thing could have been an egg, a symbol of the child I was to have five years hence. I had been told I would have a son, so the expectation was there. 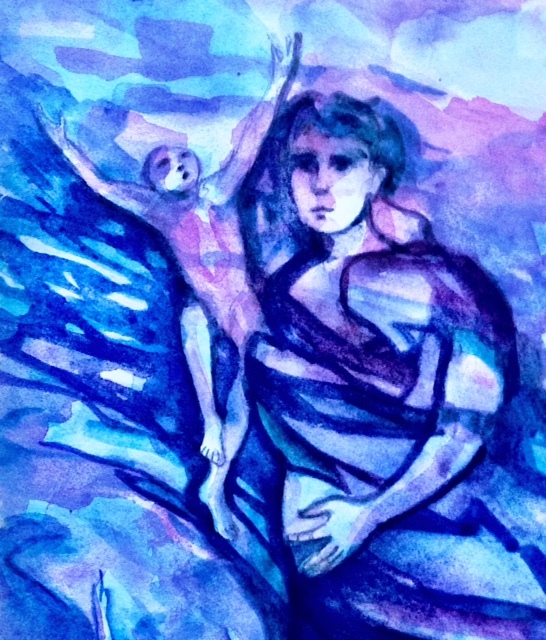 This entry was posted in ART, Memoir and tagged Art, art and feeling, art and healing, bridging heart and mind, creativity, death of one's mother, Great Storm of 1987, inner awareness, Nancy Wait, painting, the nancy who drew. Bookmark the permalink.